ANOKA, Minnesota – April 3, 2018 – Federal Ammunition is pleased to announce a new addition to its full line of Syntech handgun ammunition. 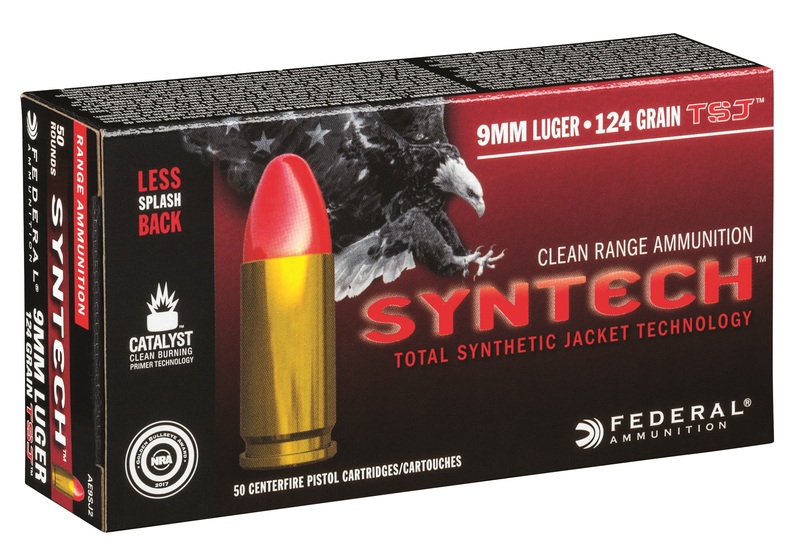 Look for Syntech in a variety of the most popular loads, including the new 124-grain 9mm Luger. Shipments are being delivered to dealers. Conventional ammunition causes metal-on-metal contact between the bullet and bore, which can shorten barrel life and hurt accuracy. The polymer-encapsulated Syntech bullet prevents this, while eliminating copper and lead fouling. Combined with clean-burning powders, your gun will stay cleaner, longer, so you can shoot more—and shoot better. The exclusive Catalyst primer provides the cleanest most consistent ignition possible—that’s why it received the 2017 NRA Golden Bullseye Award. This entry was posted in Ammunition and tagged Federal, NRA Golden Bullseye Award, Syntech. Bookmark the permalink.